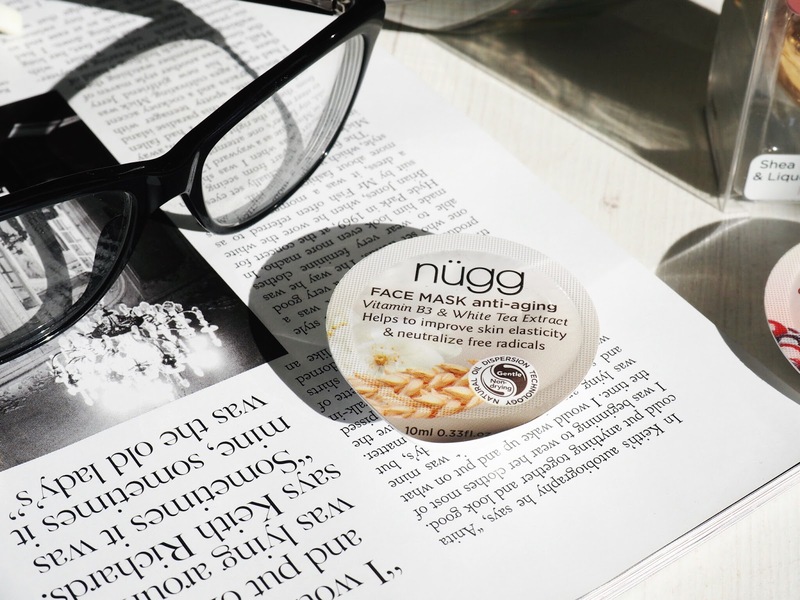 Currently being enjoyed on the face mask side of my beauty addict life, are the seriously cute Nugg products. I say seriously cute because I’m a sucker for all things cute, collectable and diddy. Yes, diddy is an actual word. 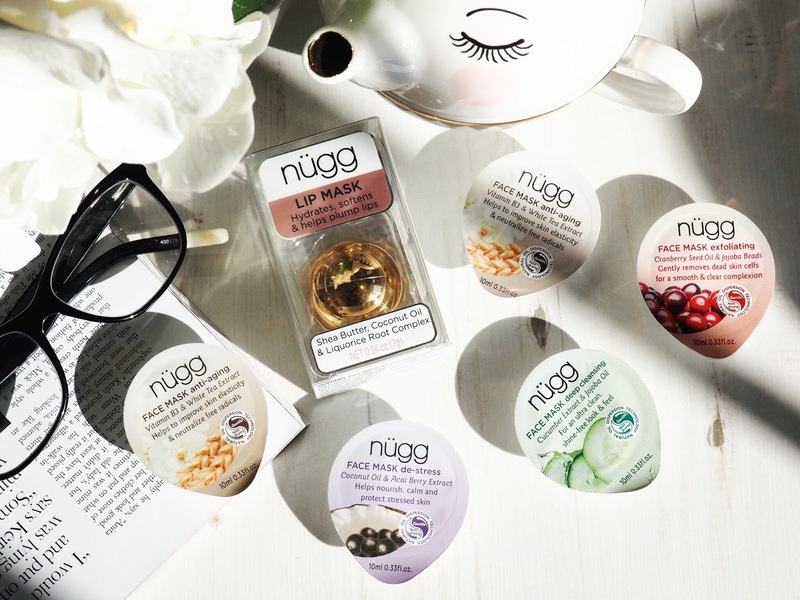 I’ve been a fan of the Nugg Face Masks for a while because they come in these really cute little pods – with just enough product for one face mask application. Well actually, there’s enough for two. Don’t let these tiny pods put you off – they have a lot of product inside. Looks really can be deceptive! I’ve now worked my way through *almost* the entire collection of their face masks, and I’m still as impressed as I was at first. They’re perfect for those who don’t have a lot of time for pampering – they only need 5-10 minutes on the skin for full effects and they don’t harden or go stiff. The texture of the face masks is really creamy – almost oily actually. Which means it goes on smoothly and considering there’s only one pot pr application, I recommend you apply generously – why not?! I usually wear face masks on Sunday for my Skincare Sunday regime and these are great little inbetweeners for mid-week face mask time. I think because the pot is a one-use-wonder, I’ve convinced myself they’re the easiest way for a hump day skin refresh. Quick to use, apply and then throw away. The last one I tried was the Flaxseed and Peppermint Oil Revitalising Mask. I gave this one a go because I recently had a minor operation and haven’t been feeling my best, so wanted a face mask to encourage radiance and just generally put some oomph back in to my skin. This mask was strong on the old peppermint scent, let me tell you! But it had such a lovely, cooling and claiming sensation that I felt so relaxed and I actually didn’t want to take it off. I knew my skin had been looking tired, and as I haven’t been wearing fake tan this week, my skin just generally isn’t looking how I like it too. This lovely little pot gave me a great little pick-me-up and was lovely to wear and the results were equally as lovely. my skin felt fresh, happy, calm and like it had just had a real treat. However I couldn’t honestly tell you my overall favourite in the Nugg range. This is because they all have individual qualities that I love. For example the de-stress mask with coconut oil and acai berry extract is perfect for a those mid-week skin treats. I find this one is lovely if I’ve been stuck on a train for hours or am feeling like my skin’s looking stressed. It’s calming and nourishing in one. It also smells lovely too. Then there’s the deep cleansing mask with cucumber and jojoba oil which is the perfect type of face mask for me because of my oily skin. It reduces the appearance of oil and creates a shine free look and feel – which is great in the heat, so perfect for using in the summer. 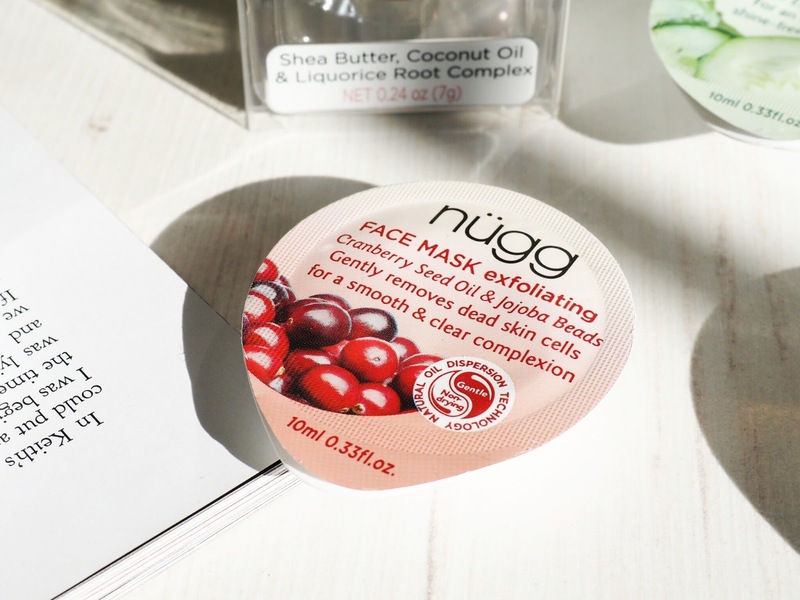 I also love regularly using the exfoliating face mask with cranberry seed oil and jojoba beads. It’s great for feeling like it cleans your skin as well as refreshes. Designed to remove dead skin cells, it makes me feel like i’ve had a full microdermabrasion facial. So it’s great for when I don’t have enough time to sit and use my microdermabrasion system. It’s also good for all skin types and reduces the appearance of pores while also working to correct a huge amount of complexion issues. It’s a really great all rounder. 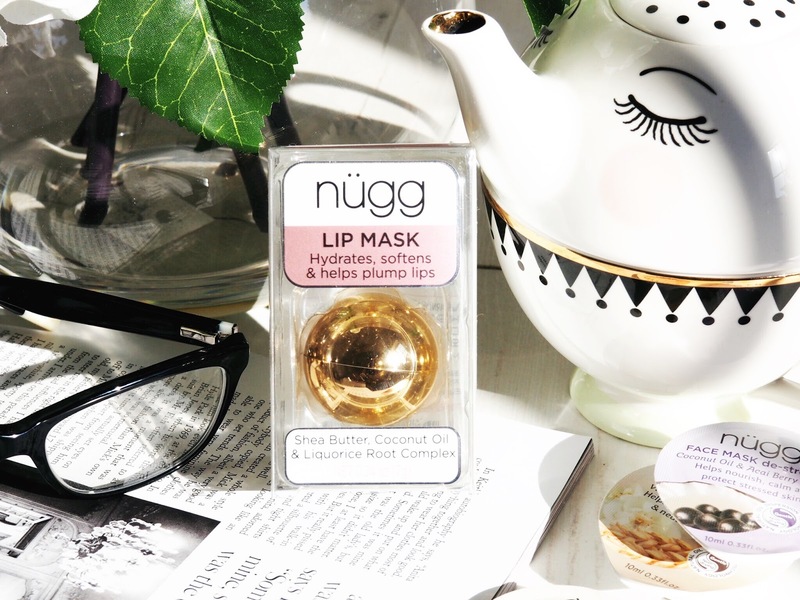 The latest addition to my Nugg collection was their Lip Mask. I’d not used a lip mask before so was interested to see what the results were like. It’s supposed to hydrate, soften and help plump lips – which sounds perfect to me, and a much cheaper way of getting fuller lips than paying for fillers! 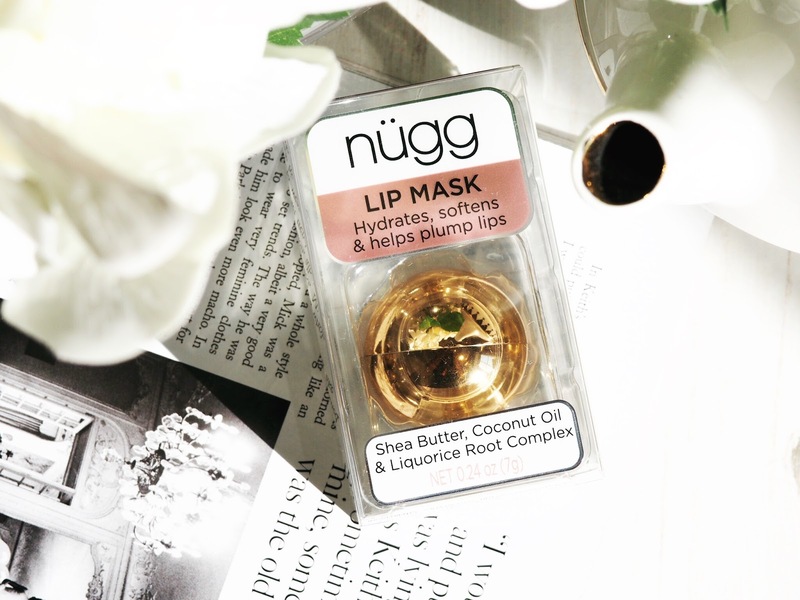 The Lip Mask comes in a really cute (are you seeing the cute theme to their packaging yet?!) golden case and has shea butter, coconut oil and liquorice root complex in it – all of which contribute towards fuller looking lips. My experience with this is really pleasant. For only £9.49 it’s an absolute bargain essential that I didn’t know I needed – until I tried it. I’ve never invested time in looking after my lips, although I invest a lot in lipsticks, glosses etc. So why hadn’t it occurred to me to future my lips the way I do the rest of my face/skincare? It’s really easy to use – apply generously, leave 20 minutes and wipe of the rest with a tissue. After each use my lips feel SO incredibly soft and supple. Like new lips. If you’ve ever brushed your lips with a tooth bush – it’s that kind of ‘new skin’ feeling. It feels fresh too when worn and afterwards thanks to the slightly minty scent and taste. It works like an intensive lip balm that protects and looks after your lips, but also plumps and softens. I can’t fault it. And unlike the face masks, the Lip Mask has more than one use in the pot. I’ve been using mine weekly for a month now and there’s still lots left, so it’s great value for money too. 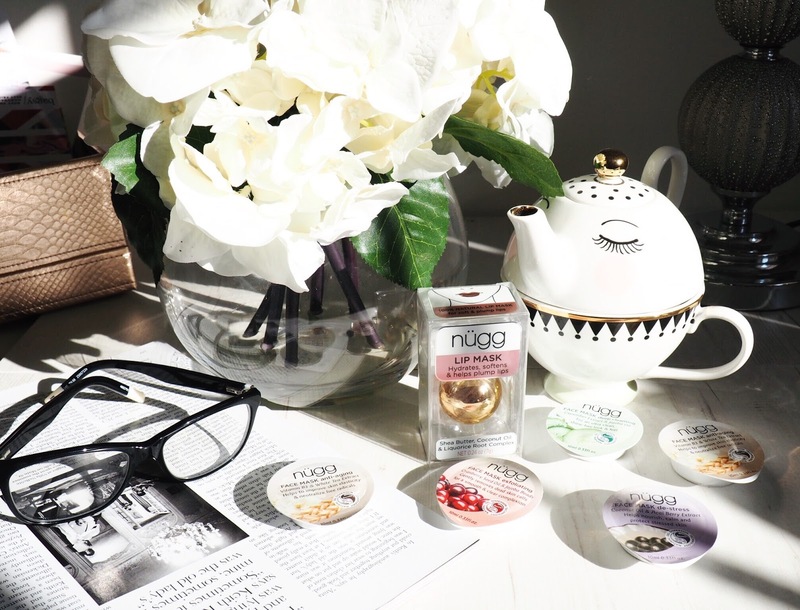 So for me the Nugg products do something that others don’t – they make intensive treatments quick and easy with the travel sized, on-the-go pots and yet they don’t scrimp on the quality. I always have one of the face masks in my wash bag, just in case I have time or need for a skin pick-me-up when I’m away. It means I know that whenever my skin needs some TLC, I’m good to go: without having to carry around a million different bottles and tubes. Get the Nugg collection here.